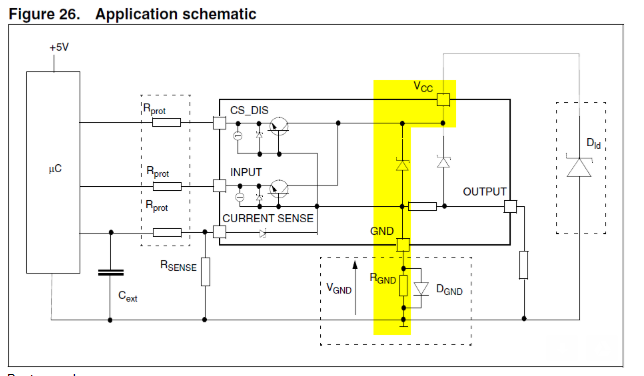 In the figure you can see the application schematic. In the datasheet they have suggested to use a resistor at the ground pin for reverse battery protection (automotive circuits). I was just trying to analyze the path the current flows during normal operation and also during reverse battery condition. Why are there two Zeners in parallel and also a resistor between the anodes of the Zener diodes? What will the output be under reverse battery? Automotive compatibility requires many repetitive impulse levels tests such as 5000 impulses at 50V. This method of protection is essential to attenuate the over-voltage in 3stages. 1) an external MOV ( Dd ). 2) a series R current limited zener. Dgnd cathode protects reverse voltages to chassis Gnd below it. Not the answer you're looking for? Browse other questions tagged analog integrated-circuit automotive zener reverse-polarity or ask your own question. Zener diode can vary current flow to maintain voltage drop, how does this magic effect work? Is a 9.6µs over-voltage transient long enough to fry my circuit (Details inside)? What role does this diode play in this reverse voltage protector circuit? MAX6966 a suitable sink driver for nixie tubes?